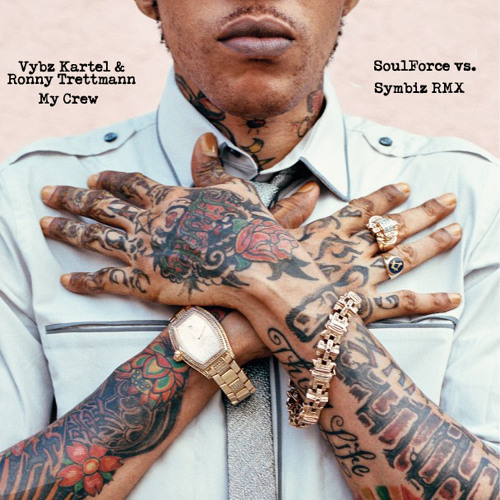 VYBZ KARTEL feat. RONNY TRETTMANN "MY CREW" (SOULFORCE vs. SYMBIZ RMX) FREE DOWNLOAD! http://www.unlock.fm/253 read all about it & check out everybody involved. http://www.mixpakrecords.com/blog/2013/03/my-crew-soulforce-remixes/ www.mixpakrecords.com www.symbiz-sound.de www.heckertempire.com www.soul-force.com This version features german dancehall don RONNY TRETTMANN who will release his solo debut album "TANZ AUF DEM VULKAN" on 10.05.2013 ! It`s a must. BUY Vybz Kartels "Kingston Story" album if you haven`t done it yet, it`s one of the best dancehall albums ever. http://www.mixpakrecords.com/blog/2012/08/kingston-story-deluxe-edition-out-today/ And check out the new Symbiz Video "SoundBoy Dead" featuring Zhi MC. http://youtu.be/Rxl64BVB2dY Symbiz debut album will also drop in may. 03.05. to be precise. MY CREW!